We knew some of you thought the idea of making your own bone broth was a little scary, but we had no idea you had so many questions! So many, in fact, that instead of answering them all on Facebook and Instagram, we decided to create this Bone Broth FAQ, with everything you ever wanted to know about broth. Let’s take the intimidation factor out of this incredibly health-promoting food! After this monster question-and-answer session, you should be totally prepared to make your own beautiful broth. Nope. Broth (often labelled “stock”) from the grocery store relies on high temperature, fast-cooking techniques, which result in a watered down, non-gelling liquid, so you’re missing out on some of the benefits of a gelatin-rich broth. In addition, unnatural additives (like MSG) and flavors are often added. If you just need a small amount for a recipe, store-bought stuff will do, but if you’re interested in the healing properties of bone broth, you have to make it yourself. Where do I get bones? Your local butcher, a local farm (ask around at the farmers market), a friendly hunter, your local health food store (if they have a meat department), or order bones online from U.S. Wellness Meats. You can also save the bones if you roast a whole chicken, turkey, duck, or goose. What kind of bones should I use? Do I have to get grass-fed or pastured bones, or organic bones? You should. The animals have to be healthy to impart the maximum health benefit to you, and factory-farmed animals are the furthest thing from healthy. (And we don’t want to encourage more purchasing of factory-farmed animals.) Do your best to seek out pastured chicken or 100% grass-fed beef bones from a local source. Can I have a recipe, please? First, there are a wealth of recipes online—just search for “bone broth recipe” until you find one that looks good to you. However, we like the Master Recipe for Bone Broth found on page 274 of our book, It Starts With Food, created by our friend Melissa Joulwan of Well Fed and Well Fed 2 fame. Even if you don’t have a slow-cooker you can still reproduce this recipe on a stovetop, with a large pot on low heat. Do I have to skim the fat? Only if you want to. Feel free to drink your broth as-is, but if you prefer a broth with less fat (as we do), then follow these instructions: After you’re done cooking, remove your broth from the heat, and run it through a strainer as usual. Then let your broth sit in the fridge for several hours, until the fat rises to the top and hardens. Scrape off the fat with a spoon, and your broth is ready to go. We think skimming off most of the fat is more important if you’re using bones from animals that are conventionally raised. What other kind of things could I add to my broth to help with flavor? Here is a list of vegetables, herbs, and spices you could add. Feel free to mix and match, or invent your own recipe. Avoid using broccoli, turnip peels, cabbage, Brussels sprouts, green peppers, collard greens, or mustard greens, as they will make your broth bitter. Adding an acid (like lemon juice or vinegar) will help to extract minerals from the bones. Use a mild-flavored vinegar, like apple cider or rice wine, as white vinegar may taste too harsh in a mellow broth. Should I roast my bones first? You can—roasting will impart a rich flavor and color to your broth—but you don’t have to. If you choose to roast your bones first, place them in a pan in an oven set to 350 degrees, and roast for one hour before continuing with your favorite broth recipe. Why does my broth look so jiggly? That’s the gelatin—when cool, it makes your broth look a little like meat Jell-O. No worries—just heat it gently on the stovetop and it will return to a liquid state. My broth doesn’t look jiggly! Why didn’t it gel? This article from the Healthy Home Economist lists five reasons your broth didn’t gel, but in our experience, it’s generally one of two reasons. First, you might not be using enough bones (or enough of the right type), or you simply might have added too much water. Bones with more visible cartilage will yield more gelatin. Another common reason is that the broth was not cooked for long enough. The remedy? Set your crockpot or burner to the lowest heat setting and just let it go for at least 8 hours (poultry) or 12 hours (beef)—if not longer. Less than that will likely not draw enough gelatin into the stock from the bones. A good rule of thumb: the larger the bones, the longer you’ll want to cook it. Can you reuse bones for another broth? What’s the longest you can leave bone broth to cook? Chicken bones can cook for 24 hours, beef bones can cook for up to 48 hours. What do I do with my broth? We like to drink a mug of it, just like you would coffee or tea. In fact, a warm cup of broth is a great way to start your morning—try drinking 8 ounces a day, every day. Of course, you can use it in recipes wherever it calls for broth or stock, or turn it into a base for your favorite soup. Keep broth in the fridge for no longer than 3-4 days. It should keep in the freezer for up to a year. For an easy addition of small amounts of broth to recipes, store some in an ice cube tray in the freezer. One cube is about an ounce, so recipes that call for 1/4 cup of broth would take 2 cubes, 1/2 a cup is 4 cubes, etc. You can store larger amounts in glass mason jars, but be sure to let the broth cool down before transferring to glass. Finally, make sure you leave enough space in a glass container for the frozen broth to expand—otherwise, the glass could break. 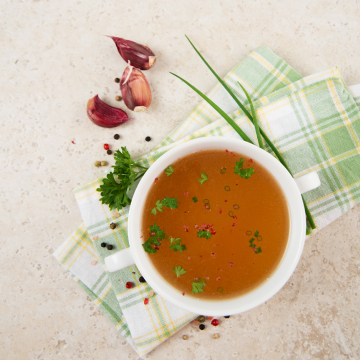 Did we answer all of your bone broth questions? Do you feel prepared to go forth and simmer? Share your thoughts in comments. I am a vegetarian, but like to make meaty things for my pups. Is there a way to make the bone broth without the onions and other ingredients that are bad for dogs? i usually buy a pre-cooked chicken for my family and once they have eaten enough, I boil the carcass and leftover meat/skin, etc. for the dogs and give them that. Any other suggestions?? Thank you for taking the time to answer when you can! Christina, you can just skip the onions. Hi, I have a question for everyone. I’ve been bone brothing for months, mostly with chicken as I always have the bones and our local organic butcher has cheap bags of offcuts and wings that I roast and then throw in. The last time I did it though, in the slow cooker for a couple of days with a three hour blast of the pressure cooker, my broth didn’t gel at all and there was no fat on top, just a layer of fatty brown scum. I scraped it off and stored the broth, but one worried I’ve down something to destroy the goodness. Hi Jac – Glad to hear you are making your own broth. Your issue might be due to the three hours in the pressure cooker after a few days in the slow cooker. You also don’t need three hours in the pressure cooker. I would just choose one method. I usually choose my 8 quart pressure cooker for 45 minutes as in the pressure cooker 45 minutes is really much longer. I also find that in addition to apple cider vinegar, adding some chicken feet ( I know it sounds weird) makes my broth always gel. I grew up in Cambodia so am down with the consumption of feet, but in Australia is it harder to get organic feet and such. I’ve tried to procure them, but they must be supplied to another source somewhere. I’ve always given the broth a blast of pressure, the process wasn’t different, but the output was. I’ve never not had hard fat on top. This was sludge. The reason I do both slow and pressure is to get that “perpetual broth” (ie a week) feeling in only two days. Can you cook the broth too long? But surely the fat would still harden on top? Awesome article. I make bone broth, mostly chicken, sometimes beef, on a regular basis. I feel so much better when I drink/consume it on a regular basis. I also add some when I cook quinoa or rice for extra nutrition. It’s also great to be able to make fresh soups with real broth. I use an 8quart pressure cooker for 45 minutes. I am too impatient for the stock pot. Pressure cooker works just fine. I strain and put them in mason jars. I do not skim the fat when I pour them in as it acts like a little sealant layer. You can take it off later when using it. Broth I will use within 4 days, goes in the fridge, the rest goes into the freezer. I thaw a container or two at a time. There is a line on the mason jars to show you not to fill past that point so they do not break when they freeze. Ensure you let the broth cool off before putting into the freezer so the glass doesn’t break. I buy bones from a local organic butcher. I am lucky to live near access to humanely raised meat and I only eat humanely raised, otherwise I am a ‘vegetarian’. It’s important for me that the animal that I am consuming was raised in a humane and healthy manner. After all I am consuming it. It is worth the slight extra cost if you can afford to do so and the taste makes a huge difference. Grass/pasture raised chickens yield next to no scum. That is how you can tell that the animal was raised in a healthly manner. Lastly, and I know this sounds weird but I use chicken feet in addition to chicken necks and backs. Yes it looks weird and to some kinda gross but if you can handle it, it will pretty much guarantee that your broth with be lovely and jello like. Enjoy your broth making. It’s awesome. First of all, I have trouble affording grass fed beef and organic chicken. Is conventional really that bad for you, I mean there is Simply Raised Chicken, and Hormone free beef. Second, can I use a stainless pressure cooker? Buy the best meat/bones you can afford. You can use those bones, but don’t include skin or fat. We don’t have a conclusive answer on the pressure cooker question, but probably so. I do what my mothers always did and use a Pressure cooker for the turkey/chicken bones to make a soup base. But someone was telling me at the w/e that high temps destroy some nutrients. is that right ? I have no intention of changing my habits, but I am interested ! Made my first batch of beef bone marrow broth soup using large stock pot on stove top. My recipe called for 6-8 hours of cooking my recipe actually called for organic grass fed oxtail and/or beef thigh bone. To which I substituted the bone marrow. 2 questions…First, is the stock ok to eat? Second question… Is it safe to leave it out to cool 5 hours or longer. (hoped to just put the pot in the refrigerator) I took it off the burner to cool & after 4 and half hours stainless steel pot was still too hot to go in refrigerator. So, I poured it into 2 containers…one was glass pitcher and the other a large plastic bowl. Broth was still very warm. My recipe called for letting it cool, put in refrigerator and when the fat hardens to remove it and strain the rest to enjoy. Lisa, strain it and let it cool before refrigerating, however long that takes. Wonderful information! I’ve been making my own bone broth for many years and this is the first website that really answered a lot of questions people to have. I wanted to mention something. Since I am in the “don’t waste anything” camp I wanted to say that when I make beef stock, after chilling and scraping off the fat, I freeze that fat and the next time I grind my own burger meat I add the frozen chunks. Adds great flavor to the burgers. I do the same with the chicken fat when I make chicken sausages. I have also used the beef fat to mix with bird seed for winter time feeding. Thanks for the great site!! Hope I’m not doing the wrong thing here, but I keep the bones boiling for weeks, an hour or so each day. I ladle off the stock to use in soups, casseroles, to cook rice and quinoa, and top up the water level as I need to. I don’t add any veg but do add cider vinegar now and then. Vivien, we’ve heard of a sort of “continuous brew” system for bone broth, but as far as I know, it involves removing the broth after 24+ hours on heat and then reusing the bones/veggies by adding more water. We can’t give any specifics about the safety of your method or confirm if it’s safe to use/drink or not. You may need to do more research elsewhere to be sure. My neighbor told me she makes bone broth by using all the bones left by her family after eating. She roasts a chicken, so has the carcass, and then gathers all the used bones off the table and uses them. What are your thoughts on this? I buy grass fed beef bones from an organic farm. Usually I defrost them and start the broth right away. However, recently I defrosted the bones and had to put them in the fridge and was not able to start the cooking process for about two weeks. By then the bones were smelling. I washed them thoroughly until the smell was virtually gone. They are cooking in the crockpot now. My question is will the broth be good to eat? The smell as they are cooking is the same as all the other times I’ve made broth. Richard, sorry we’re not able to give food safety advice at this level! How long will bones keep in the fridge? (i dont want to freeze them if that is not necessary). Thank you. My curiosity will kill a couple cows and a few chickens. After the initial batch of bone broth, how long will the bones stay fresh in the refrigerator for making more batches of broth? I’m assuming the bones will last longer since they’ve been cooked once already? Please advise. Thanks!! Just made chicken broth (back, necks, and feet). I put half the bones (and half the vegetables) in my crock pot and half in my soup pot on the stove. As my crock pot is small (3.3 quart), I was able to put more water in the stove pot–although the ingredients in the crock pot were all covered. I cooked both for 20 hours. I had difficulty in getting my stove to do a slow simmer; so, when I got up this morning, I needed to add more water to the stove pot. And then, I continued cooking both for another 4 1/2 hours. When both were finished cooking, the broth in the stove pot was much, much darker and had a much richer taste than the broth in the slow cooker. Any ideas why this would be? Darlene, maybe a higher temp on the stove maybe? Maybe the crockpot broth needed more time? Can’t be sure. Thank you so much for this post! What a wealth of information. I never knew there were so many health benefits to the consumption of home bone broth. My husband and I made our bone broth in our pressure cooker. It just took 3 hours of cook time. Please help. I went to sleep last night with my bone broth on low. Woke up this morning with it just warm, no simmer. I got it back up to boiling as soon as I realized but is it still safe to use? Its been going for over 24 hours. The plan was to the veggies this morning to finish up. But I want to waste more if this should be tossed. Hi, Thank you so much for the very helpful article. I still have a question though. If I am going to reuse my beef bones for a new batch of broth can I store them in the fridge or freezer for later use or is it necessary to make a new batch right away? Also, I buy my meat from a local rancher when they sold me a 7 bone roast they said if I roasted it in the crock pot overnight with water and no seasoning I could use that as bone broth is it ok to use the meat on the bones when you make the broth if you don’t add any seasoning?